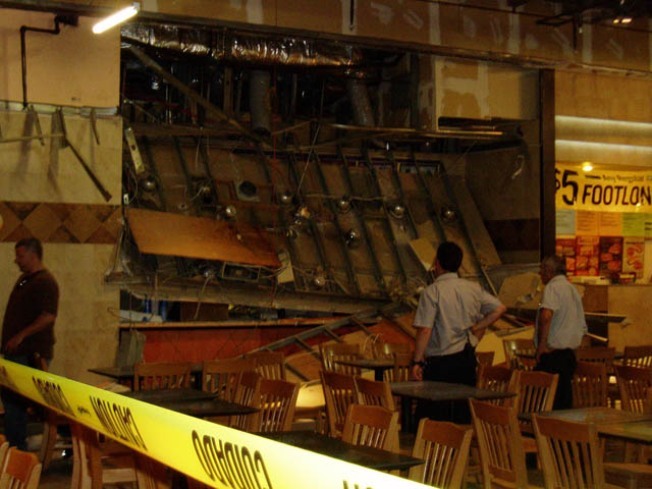 This was the scene last month when part of the ceiling at the food court at the Trumbull Mall collapsed. Now, the food court is closed again for a second incident. There will be no meals served in the food court Westfield Trumbull Mall after the second façade collapse in the dining area of the shopping center in two months. On Saturday afternoon, part of the facade above Sbarro's Pizza collapsed, injuring two people, the Connecticut Post reports. Last month, a 200-square-foot section of roof over Taco Bell in the food court fell. Three workers inside the restaurant were able to escape from under the collapsed sheet rock, police said. No customers were hit by the falling debris. So, now, the area will remain closed at least for a few days while it's inspected, a mall spokesperson told the Post. The town's building officials are working with mall management, its construction company and engineers to determine the cause, Trumbull First Selectman Timothy Herbst told the newspaper.